Colours are a topic that come up quite often here at Silke. What colours go with what, what certain colours mean or evoke (by themselves or in tandem with other colours), and which colours are favoured by certain schools of design. As always, we feel it important to state that there is no “correct” choice of colour in any aspect of kitchen design; what works for what will depend entirely on any given individual. With that said, however, we’d like to take a little bit of your time to talk about the colours you most often see in kitchens, particularly ultra modern, German style kitchens like the ones we provide here at Silke. Perhaps the most obvious you’re likely to think of are White and Black. This makes sense; Black and White are both neutral shades more then distinct tones, and they pair off with the metallic Grey sheen of the appliances likely to dot the kitchen space. White, as we’ve previously discussed before, evokes a certain clinical, practical feel in abundance, and in a modern kitchen designed to be as efficient as possible that can work wonders. Psychologically speaking, it creates the idea that your kitchen space is as efficient and high-tech as it appears to be, and that can have a wonderful confidence boosting effect on both it’s users and guests that enter it. Black is interesting; though often unfairly associated with negative aspects or a vaguely authoritarian air, it’s intrinsically linked with the idea of the “modern” when it comes to design. This can be seen in how many predominantly stainless-steel appliances and decorative fixtures accent their overall reflective grey colour scheme with touches of black. Even schools of design not restricted to the kitchen seem to understand this, hence it’s commonality in the present day. The advantage that both of these colours have is the previously mentioned neutrality. By the simple virtue of being hard shades at opposing ends of the colour spectrum, they can be paired off with more or less any colour without issue. Although the fusion of colours and tones in any combination is always going to be highly subjective, most everyone can agree White or Black will work no matter what you mix them with- though rarely when you mix both White AND Black together with another tone. 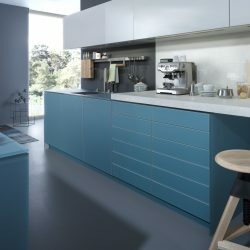 What colours do we at Silke think work in a modern kitchen setting? If we had to play favourites, we’d probably say cooler colours such as Blue tones or Purple tones. Stainless Steel has a natural coldness to it- figuratively as well as literally- and cooler tones work in tandem with that to deepen the atmosphere without shattering it. A little bit of colour highlight breaking up the wall of hard shades also helps offset the more clinical aspects of said atmosphere with a little bit of personality and, ironically, warmth. In theory, however, almost any colour or tone could work in a modern kitchen setting, though we would recommend in smaller doses personally. We offer a wide range of paint styles and colours, provided by one of the best paint companies in the country. If you have any further questions regarding this subject, or would like further consultation on a project, please feel free to contact us for friendly and helpful information provided by our expert design team.